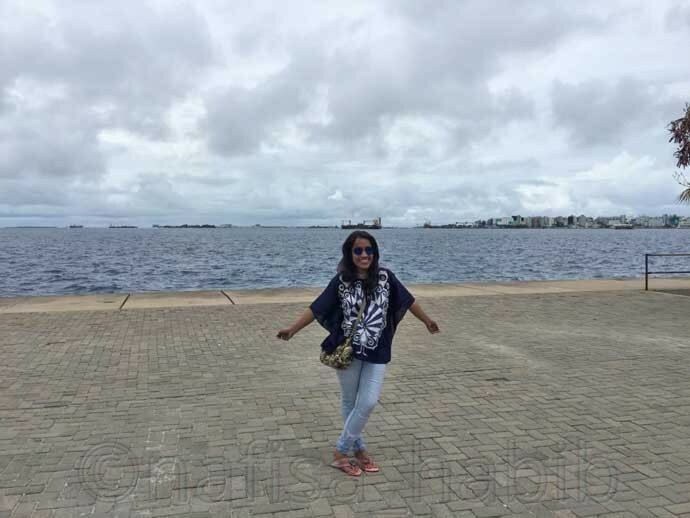 During my solo trip to the Maldives, I visited Hulhumale, Villingili, and Himmafushi islands. I also had a quick visit to Male, the capital of the Maldives. I had no idea many adventures waiting for me in the Maldives. There are many top things to do & see in the Maldives. And interestingly possible to explore those on a budget. 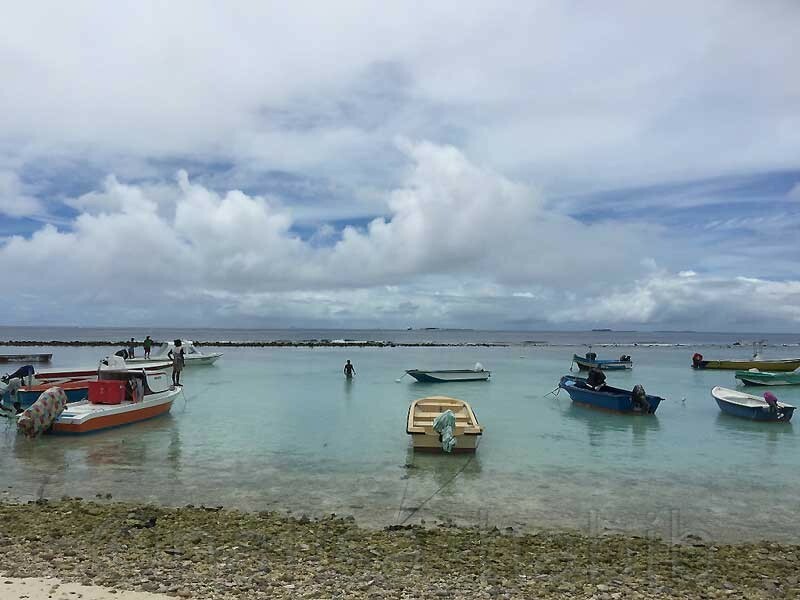 My three days the Maldives solo travel itinerary will help you get many insights and money saving tips. Even without traveling solo you can make a budget tour in the Maldives. A short video on my solo travel in the Maldives before you’re going through inside. 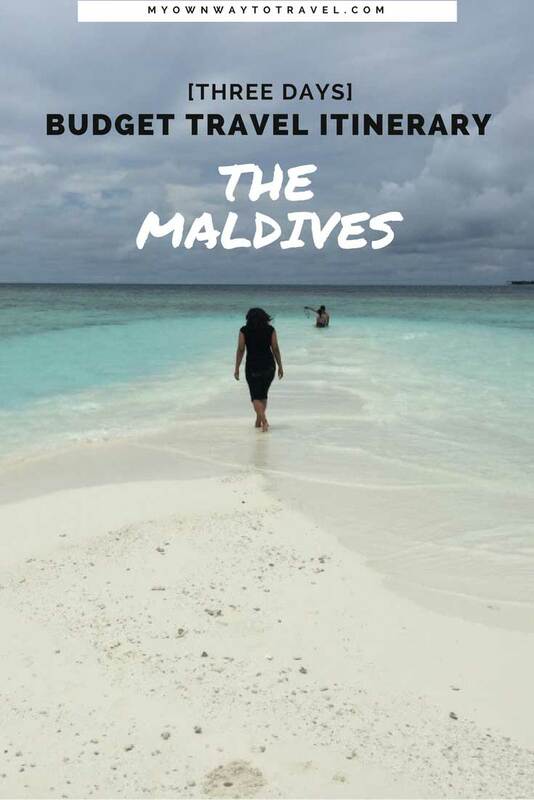 1 How To Travel The Maldives on a Budget? 4 Are You On Pinterest? Click To Save These For Later Read! How To Travel The Maldives on a Budget? It was a pleasure to fly with SriLankan Airlines from Colombo to Male. But unfortunately, the flight was delayed and couldn’t reach Velana International Airport on time. And also nobody came to pick me from Kalaafaanu Retreat which I pre-booked through Agoda. I was shocked by the unprofessional attitude from this hotel authority in the Hangnaameedhoo Island. So here it is, you never know what might happen on the way. It was almost 10 pm (Male Time), and I was still at the airport. I found one guy from HM Retreat. He offered me to stay at this hotel which is very near to the Male Airport in Hulhumale Island. He sounds good, and instantly I decided to stay at HM Retreat. Sometimes you got to take a risk by trusting the new peoples around you throughout your solo journey. And so someone was right to say, believing is nothing but taking the risk. And later I came to know this guy works to transfer guest from hotel to airport and vice versa. No visa required for any countries to stay for one month as a tourist in the Maldives. Must have to show the pre-booked hotel details to the immigration authority at Velana International Airport or Male International Airport. The Maldives is a Sunni Muslim country. So it is better to be aware of the Maldivian’s custom and tradition throughout your travel in the Maldives. Friday after 7 pm no public ferry/speed boat transfer service from the airport to any islands. Private speed boat/seaplane transfer service is available always. A budget hotel or guest house is the best option to save money on accommodation. I liked my three nights (50$ per night) stay at HM Retreat. Breakfast is complimentary here and you can also access free Wi-Fi. Beautiful Hulhumale Beach is just a walking distance from this hotel. It takes just 12 mins to 15 mins to reach HM Retreat from the airport. I found many of them are working at this hotel from Bangladesh. They all cooperated a lot, especially Mr. Rajib, made my solo travel in the Maldives a memorable one. Moreover, it was nice to see many Bangladeshis in the Maldives. Most are here with work permits. The beautiful Maldives blessed with more than 1000 islands and 26 Atolls. To hop on an island, you must take the private/public ferry to speed boat and seaplane service. But exceptions are there for Hulhumale Island and Hulhule Island or Airport Island. Only these two islands are possible to visit by road. I enjoyed my three days budget tour in the Hulhumale Island which is under North Male Atoll. 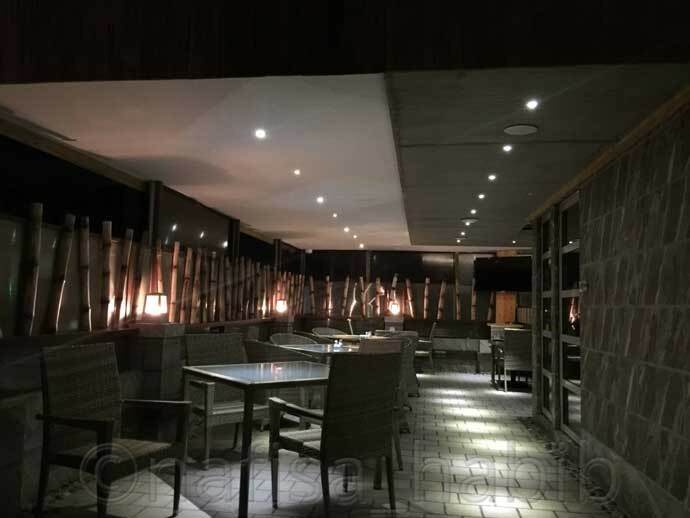 There are many budgets to luxury hotels and restaurants in the Hulhumale Island. There is one beautiful mosque, and one central park, which is favorite among locals. Many constructions are still going on in Hulhumale and came to know just some years back also this artificial island was not much popular among tourists. Now became a popular one. I loved the beautiful roads and the greeneries in Hulhumale. I found this island is a beautiful one and best to explore by walking or biking. Two wheelers are drastically common in the Maldives. Here in the beautiful Hulhumale Island, I saw many rough and tough local guys with long curly, dye hair biking very fast. But you must have to take the help of locals to enjoy biking. 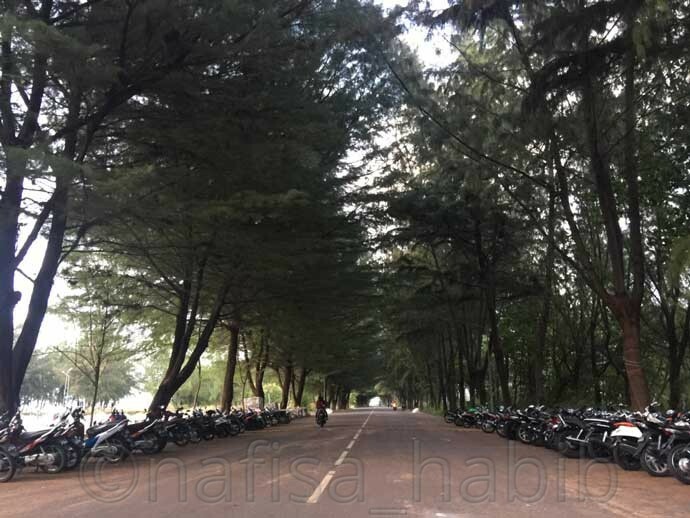 It is safe to move around on the Hulhumale Island. Local police are cooperative and strict enough. Avoid any unexpected offer from some local guys. They might try to bribe or tease you while traveling alone. My FIRST DAY in Hulhumale started with the fantastic beach view from the hotel room window. It was Friday. Last night I could not understand anything. Early morning after watching the sunrise view from the Hulhumale beach I became so happy and just forgot all the bad moments from the last night. Love you, dear nature! You are always more than enough to give me unlimited happiness. Friday and Saturday are the weekends in the Maldives. Friday during prayer time (12:30 pm – 1:30 pm) all public services are closed for one hour. I enjoyed making a short visit to Male and Villingili Island by taxi and public ferry. Villingili is a local island, and the Villingili Beach is within walking distance from the Villingili Ferry Terminal. There are also budget hotels and restaurants in the Villingili Island but not a touristic one. Hulhumale Ferry Terminal is near to HM Retreat hotel. The easiest way to explore Male, the capital of the Maldives from the terminal by public ferry or speed boat service. Local island Villingili is very close to Male and possible to explore from Villingili Terminal by public ferry or speed boat service. 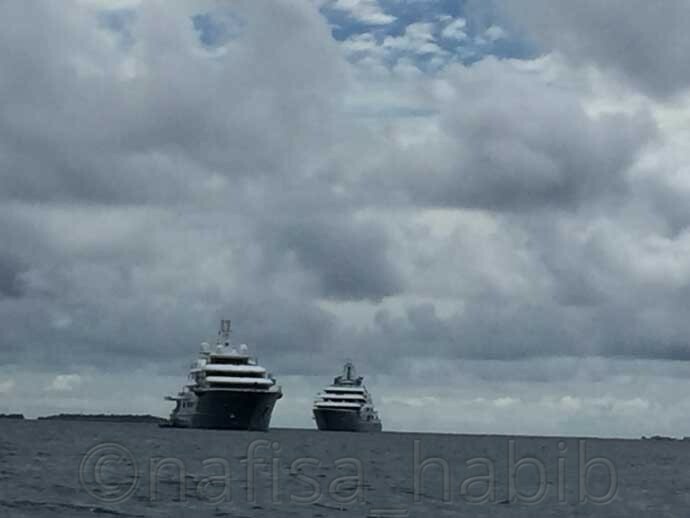 By the way, the public ferry service in the Maldives is very standard. And this is the cheapest transport service in the Maldives. You’ll generally see locals traveling by public ferry. Go local if you’re on a budget tour in the Maldives. Trying many water sports in the Villingili Island is possible. I found locals enjoying fishing and also playing football in Villingili Beach. 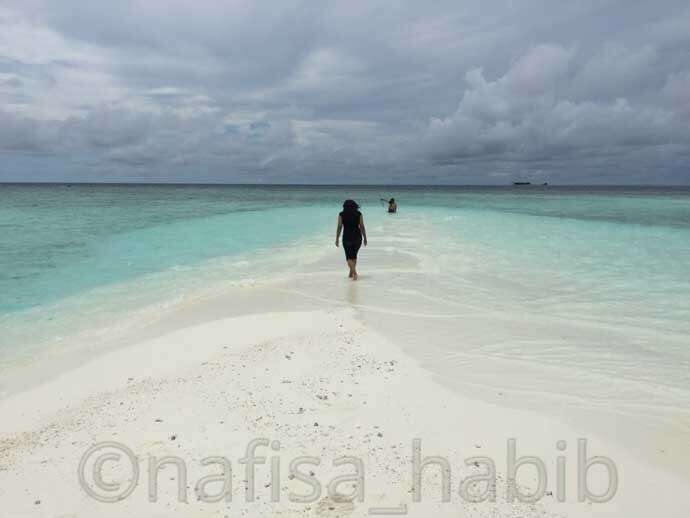 Many Maldivians enjoy a family trip to the local beaches on Friday. You might like to book The Maldives tours, attractions, and activities online or check out some of the options below. My SECOND DAY in Hulhumale Island was the most enjoyable one. 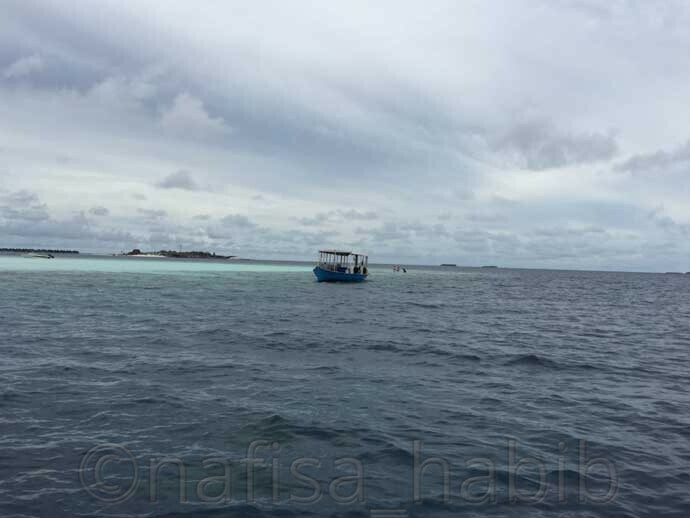 I went for a day tour with one group of 14 travelers from the Hulhumale Ferry Terminal by boat to explore the mesmerizing beauty of the Maldives. The entire day tour including lunch, island hopping, dolphin watching, and snorkeling cost me just 130$ but gave me unlimited fun. The other 14 travelers were from the USA, Canada, Pakistan, Sri Lanka, Sweden, Singapore, and Malaysia. We altogether had the real fun at Sandbank. Loved to explore the underwater beauty of the turquoise waters while snorkeling. Snorkeling in the Maldives is much fun. 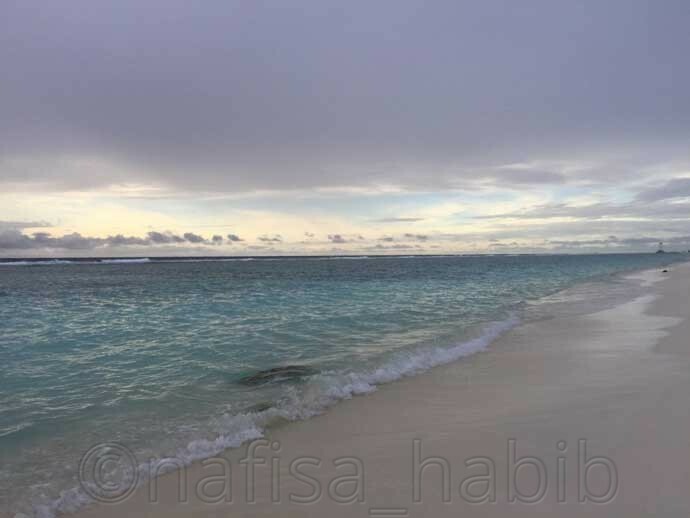 Himmafushi is also a local island and best for budget travelers. 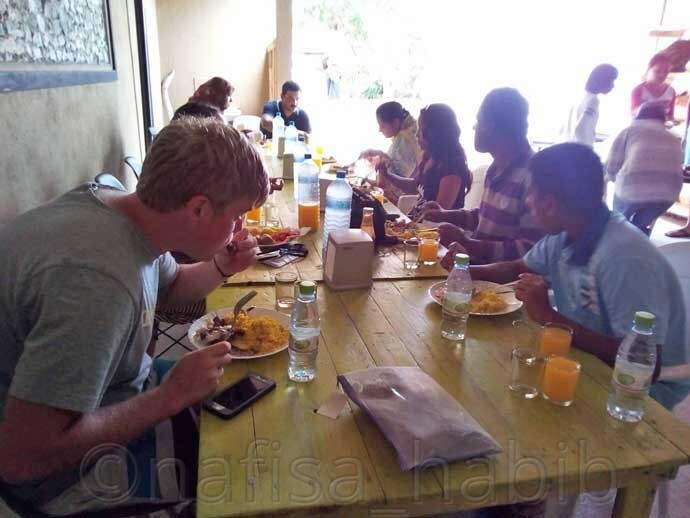 We had lunch together with delicious Maldivian food on Himmafushi Island. We enjoyed fishing, watched the Dolphins. 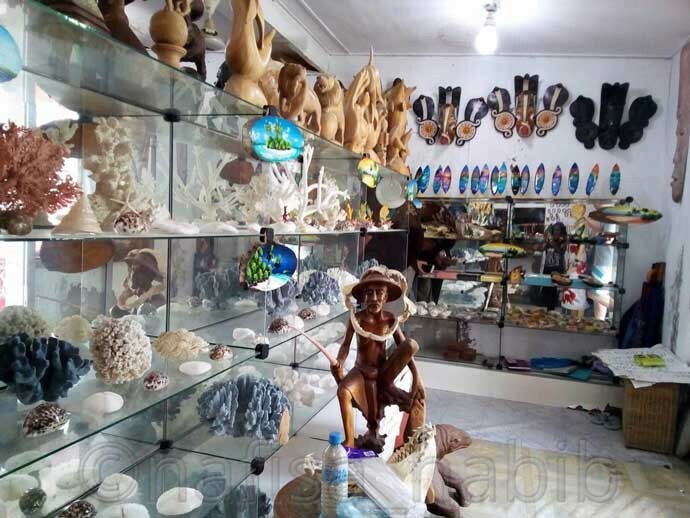 And also I loved the excellent shopping in Himmafushi. And I had sweet coconut water from Himmafushi Island. This fantastic day tour organized by Mr. Musthafa, from Dream Adventure in Hulhumale, and his cooperative team. Hulhumale is also best for any water activities fun. Adventure in Hulhumale you’ll love and enjoy. You can try many water sports in Hulhumale. 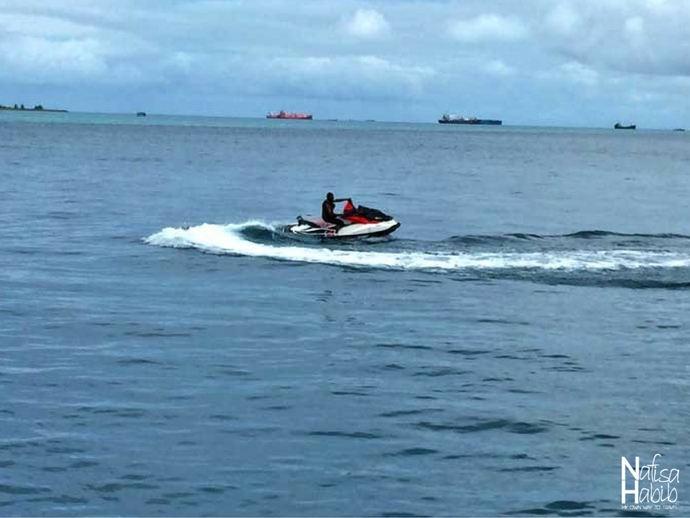 I enjoyed Jet Skiing at Hulhumale Beach. It took 45$ for 30 minutes. I loved the breathtaking landscape just before sunset. It was fun indeed. It was a great pleasure to meet Mr. Matthew from the USA at HM Retreat. He is exploring Asia for 20 years in various countries. He loved to throw a dinner for some of us from HM Retreat. We had good food and time together at Ocean View Restaurant. For making this moment memorable and sweet, we had Red Velvet Pastry after dinner at The Catch 78 Restaurant in Hulhumale Island. Hence it will always be right to say that your journey might be solo, but throughout your trip, you’ll meet some nice peoples. And the moment you share with them will always be the memorable one to cherish forever. LAST DAY in the Maldives I gave some moments to entirely myself. I loved to walk alone beside the white sandy beach during the golden hour. I kept gazing at the turquoise crystal waters. Totally embrace this moment and the beauty of my solo travel in the Maldives. The only road which leads to the Male Airport is beautiful. You’ll enjoy the beach view while passing the road. 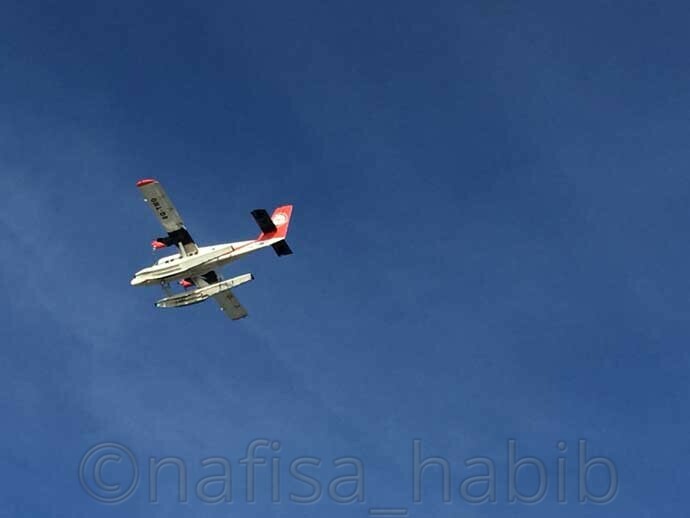 In conclusion, must manage a window seat to enjoy the top view of the Maldives from the sky. What a beauty! The Maldives, truly the paradise on earth. 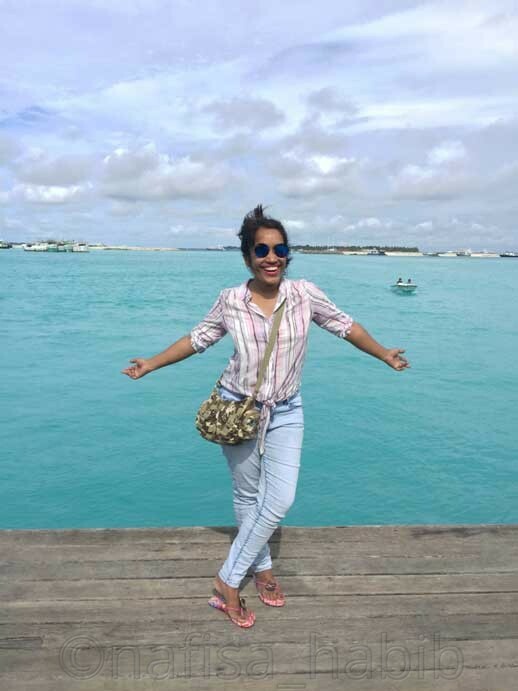 I was happy to make a safe and exciting solo travel in the Maldives on a budget. I’ll love to come back. I expend only 359$ during my entire Maldives tour excluding air ticket fare. 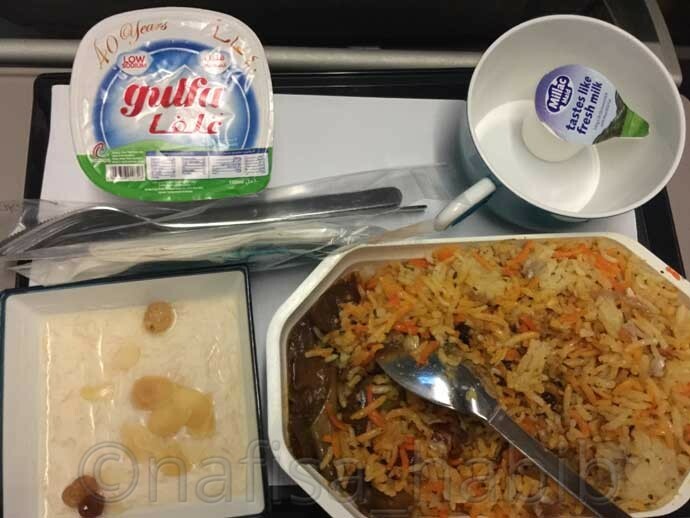 I traveled via Colombo to the Maldives by SriLankan Airlines. My route was Dhaka to Colombo to the Maldives. By all means, Avoid luxurious water villas and resorts in the Maldives for accommodation. The accommodation cost is high on the private islands. You’ll find many budget hotels in the Maldives on the local islands. There are also many cheap hotels in Male; you can book through Airbnb. It will help you to reduce cost. Also, take the public ferry service to explore many islands. Per person by public ferry will cost you less than 1$. But for the public speed boat, you have to count 30$ – 50$. Furthermore, if you’re in Hulhumale or Male, try to take public bus service. It will reduce your cost. For any short distance the minimum taxi fare (25 MVR). Have Maldivian food from local restaurants. The best time to visit the Maldives in the low season (April to September) to avoid excessive travel cost. Use local currency MVR instead of USD dollar; you’ll be able to save the right amount of money. For more query, you can write to me or comments below. Are you planning a trip to the Maldives? Oh my god, sorry to hear your experience about Kalaafaanu Retreat. So did they refund you the booking? Did they say why they didn’t turn up? I’m thinking to stay there for my trip to Maldives in the second half of the year. Would you recommend staying in Hulhumale or Villingili? Well, I’ll like to recommend Hulhumale. Have a good day Eva! Thank you for your advice 🙂 Happy travelling! Have a good day too Nafisa! Hi Deepak, thank you for asking. As you’re looking for a budget one then I can suggest you stay on any local island like Hulhumale or Villingili. There are many standard mid-range to budget hotels are there. But for a resort, you’ve to pay a bit high. U seem to have a great time. After seeing your post, I remembered my trip to Maldives. Water is anyway fun. Very informative post. I have been planning to visit Maldives for long now! Your pictures look so much fun! I now hope to visit there soon. As much as I would LOVE to stay in one of those over water bungalos I know that would be way out of budget. Good to know this place can actually be affordable! 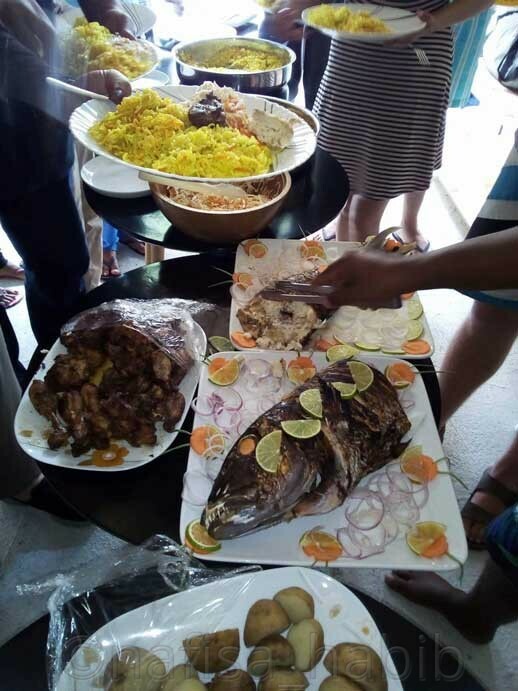 It looks like you enjoyed yourself, I am sure the food was amazing too! Yes, those overwater bungalows not everyone can afford. Thanks Apu for this nice description of your amazing tour. How much it will cost for two person including air ticket.If we go for honeymoon. For 3 days it might cost you 1500 to 1800 dollars, air ticket fare varies! The Maldives definitely won my heart and a solo travel there is an awesome idea! 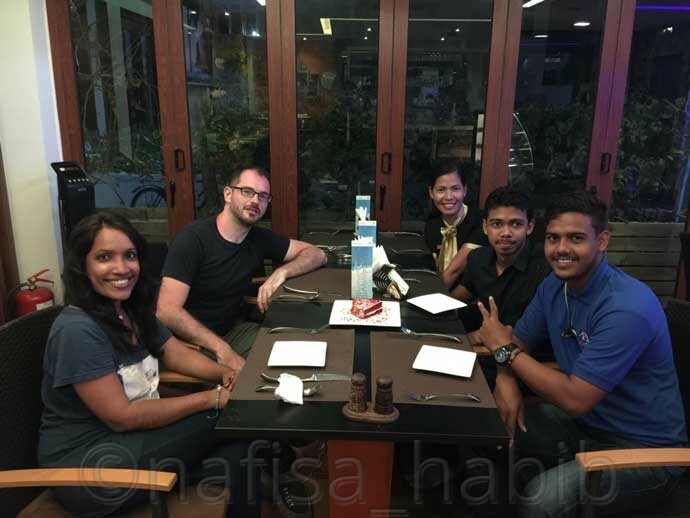 It is definitely possible to travel there without breaking the bank, Nafisa. Exceptional post which brought back so many wonderful memories! This is so fun as you usually see posts about luxury stays in the Maldives. What a great way to explore and learn about the different places. 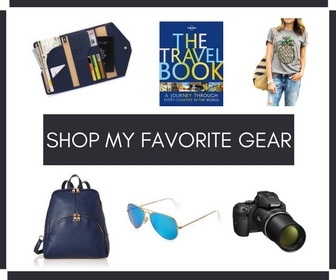 Great post and love that you traveled solo. Hi Alison, a pleasure to know you find this post the great one. 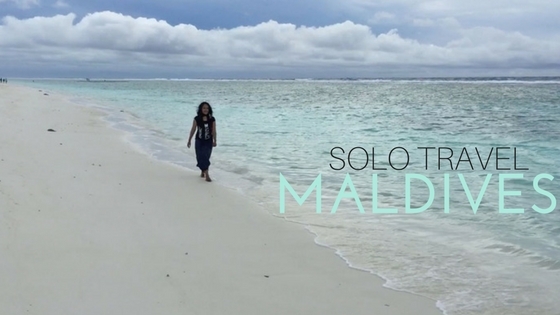 Yes, even traveling solo possible to have much fun in the Maldives. And it was a complete budget trip. Thank you! 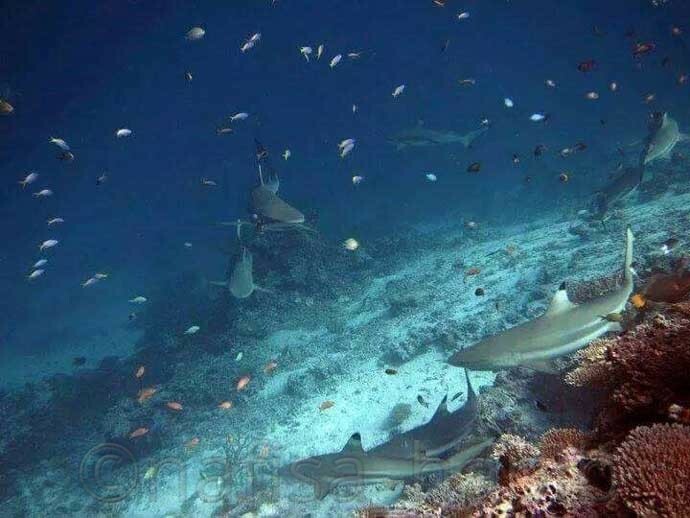 Love the photo of the underwater world!! Great to know. Thank you too! 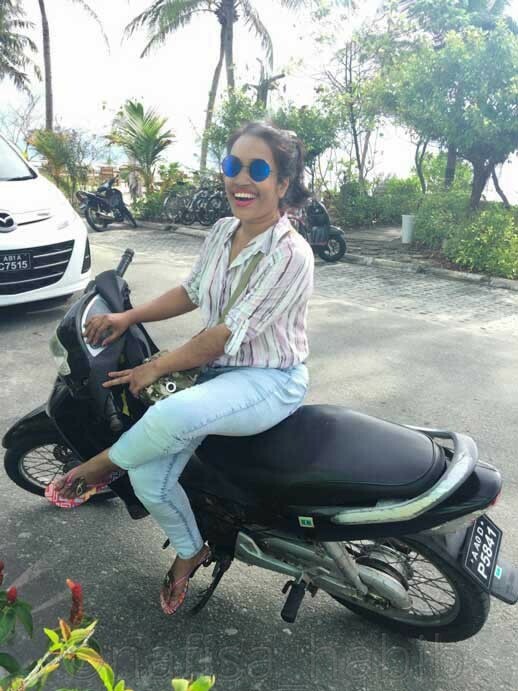 Thanks so much for sharing these tips to be able to enjoy the Maldives on a budget, it’s always seemed such a super luxe super expensive destination that I never thought about it being possible to do an affordable holiday there. 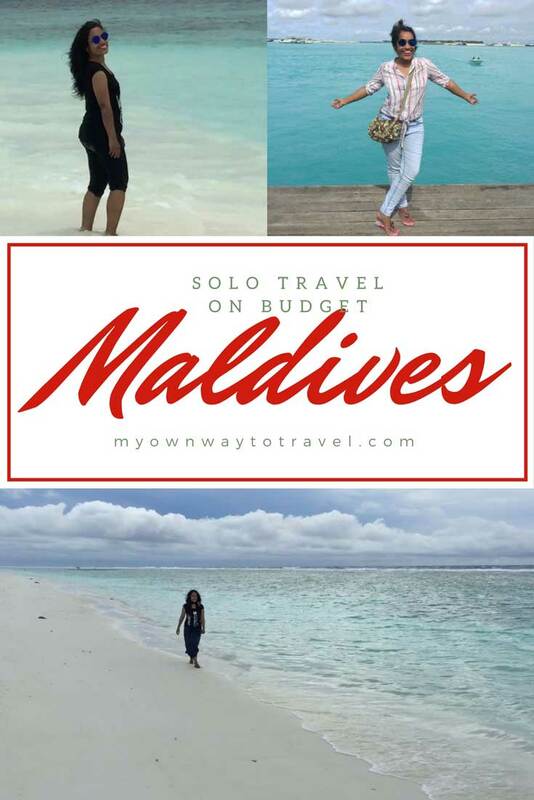 Maldives, Budget, Solo do make a strange combination. But you have shown by example that all three can be blended together into an intoxicating cocktail. There is so much to see and experience in the Maldives and can see you really had a great time. Your smile tells it all. I love your article on the Maldives. I’m planning a 7 day trip from Feb 10-16, 2019. I will be flying in from Kuala Lumpur into Mali (which I thought was the best option). 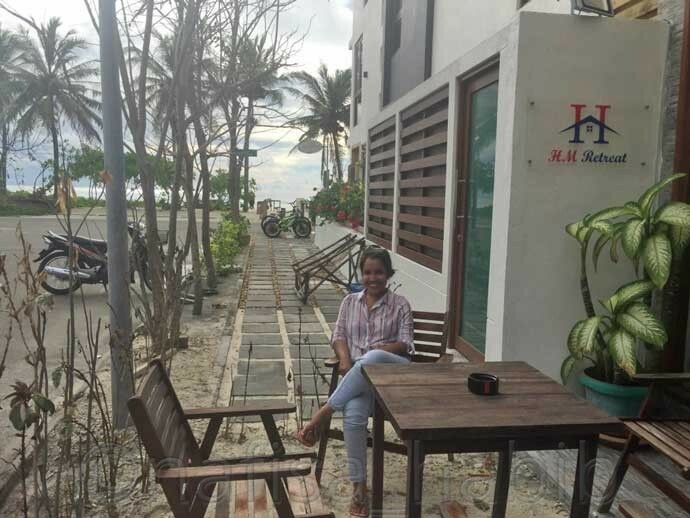 I”m planning to stay at the Island Beach Hotel on Hulhumale and then go to the Thoddoo Retreat on the North Ari Atoll. How do you travel between the islands? Are there any options? what is the most reasonable option? I’m planning to stay at the Island Beach Hotel on the day of arrival and the day before I leave as they include transportation to and from the airport. Hey great to know. There are many options. The most reasonable option is the public ferry and there is public speedboat as well. You can even try private speedboat and seaplane to travel between the islands. Let me know if anything else you need to know. Happy trip to the Maldives! How much it cost Public Speed Boat? You have to spend per person 30$ – 50$ for the public speed boat. Maldives is a such a beautiful destination I would so love to visit. Great to see you enjoying on this lovely retreat. I didn’t know there is no visa requirement for one month stay. Glad to know the trip can be planned on budget as well. I’ll keep all these tips in mind when I’ll plan my visit. Thanks for sharing. Your pictures are absolutely amazing! Great photos. Did someone take them for you? I’m interested in going to Maldives for longest time but it is so expensive. Now I have options. Thank you, my photos captured by locals around. Yes, you can make the budget tour as well. Your review was very great. I am planning my visit to the Maldives with my wife on Mafushi Island. I have read your review and in the start, you have mentioned about the Public Ferry Timings. I actually have 2 questions. 1) In your review, you have mentioned that public ferries will work on Friday till 7 pm. If I reach 8.15am on Friday in the morning, will I able to avail their services? 2) Secondly, How much exact time the immigration+visa issuer can take? As I will be arriving at 8.15am on Friday, Can I book 12.30 pm Speed Boat or should I take later one? If any more questions come to my mind, I will definitely ask. Hi Farhan, thank you and good to know you’re about to visit the Maldives. Well, I mentioned already about public ferry/speed boat transport details inside the post. Yes, public ferries are available on Friday morning, only prayer time (12:30 pm – 1:30 pm) they close the service for one hour. It will not take much time at the airport immigration unless the queue is long. You can book any private transport services at any time. However, if it is a public speed boat, then 12.30 pm is prayer time, and you should take later. You have to spend per person 30$ – 50$ for the public speed boat. Yes, sure you can ask any questions, glad to help you out! I had no idea you could visit the Maldives on a budget! Surely there are always options but I think you did it pretty well! Great itinerary too, I will be there one day too hehe! 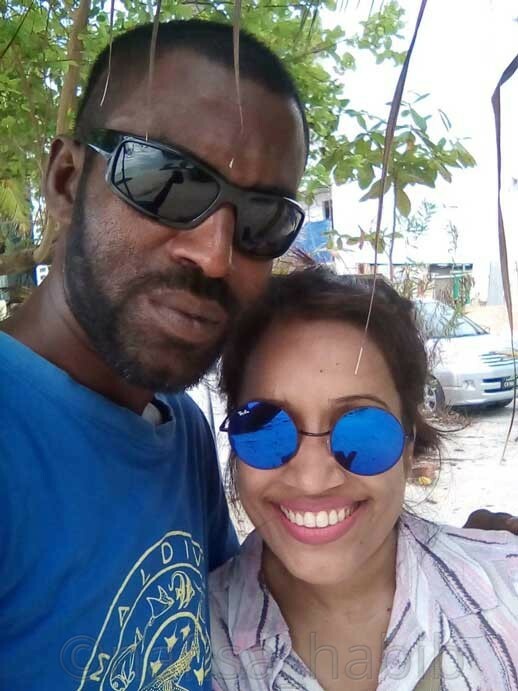 Enjoyed your articles on solo travelling in Maldives. Lots of visitors ask us if local islands are safe for solo travelers, especially female travelers and we request them to read your reviews. I am glad you want to come to Maldives again. We would love to work with you to plan itineraries for solo trips to other parts of the Maldives. Do let us know when you will be visiting.